Daddy daughter hair care sessions. 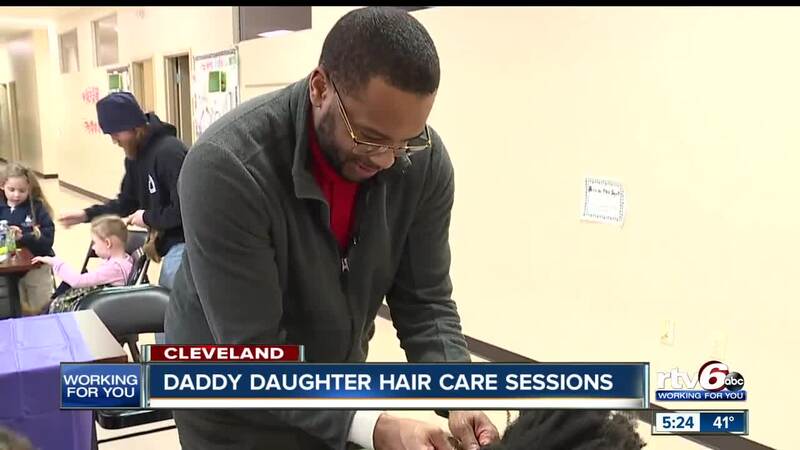 CLEVELAND, OHIO — Two Midwest hairstylists put a different spin on parenting. By teaching dads how to do their daughter's hair. For most dads, doing their daughter's hair doesn't come to them naturally. One father, Frank Whitfield decided to take the class. "Were [him and his daughter] always taking pictures and my wife later on looks, and she's like, 'what were you doing? What did you do? Why didn't you call someone to help?'" He explained. "These are our princesses, they are a reflection of us," Whitfield said. "So many of these men in here, you can see how much they love their girls. It brings out another part of us, as well." Hair salon owners, Tieya Riggins and Tia Werts, are the hairstylists behind the community learning session. "They really were engaged and really want to learn so that kind of puts a smile on my face," Werts said. "You won't get it on your first try, you may not even get it on the fifth try, but if you keep at it you will eventually get it." Dads participating said it's not about being perfect, it's about being present in their daughter's lives.